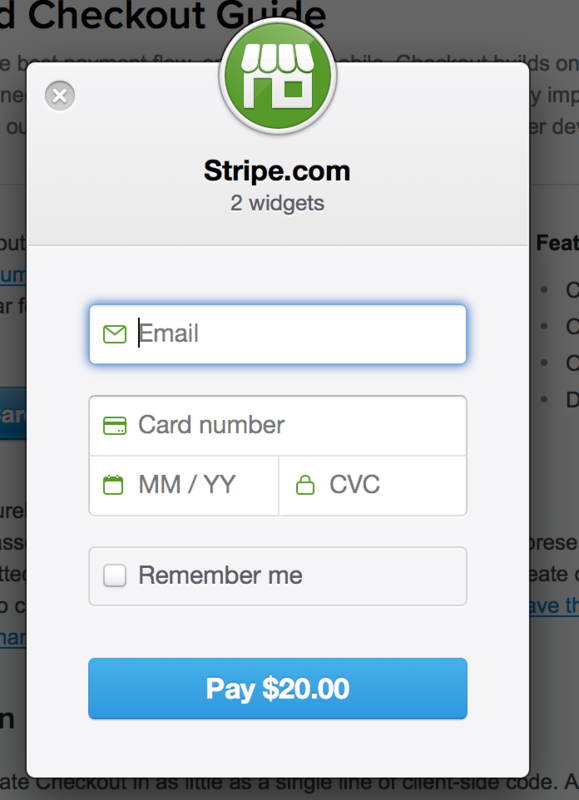 This section provides an overview of what stripe-payments is, and why a developer might want to use it. It should also mention any large subjects within stripe-payments, and link out to the related topics. Since the Documentation for stripe-payments is new, you may need to create initial versions of those related topics. Insert below code into your webpage where you want to have a checkout button. An example how to run stripe out of the box with wsgi from a single file. the backend charge part contains the secret key. Detailed instructions on getting stripe-payments set up or installed. Server-side, in your backend code (in PHP, Python, Ruby, or whichever server-side programming language you prefer), you use the token in a charge creation request to actually charge the card. The point of this 2-step flow is that your server only works with card tokens and never with raw card information. This means you never have access to card numbers, which greatly eases the burden of PCI compliance. Stripe's documentation is pretty extensive and includes many examples and tutorials -- make sure to check it out!